Home » Retirement Planning » How Much Social Security Will I Get? For most people, Social Security makes up just under half of their retirement income, so it’s an integral part of planning for your future. But how do you know how much Social Security you will get? The government used to make it easy, mailing out annual Social Security statements with an estimate of a person’s potential benefits. But once those mailings stopped in 2011, many people have no idea how to determine what their benefits would be. Fortunately, it’s not difficult to figure out how much you will receive in Social Security benefits. There are a few ways to see the exact amount you’ll be getting and a few ways to get a good estimate. Your Social Security benefit payment is based on a sliding scale that accounts for your income, how many years you worked, and what age you start receiving your benefits. What’s the Average, Minimum and Maximum Social Security Benefit? You can also get a good idea of what your Social Security benefits will be just by looking at the average and the maximum. The average Social Security benefit for a retired worker in 2017 was $1,404, with a disabled worker drawing $1,197 on average. The maximum possible benefit sits at $2,639 right now for people retiring at 62, but you would have to earn the highest taxable earnings for over 35 working years to get that payout. 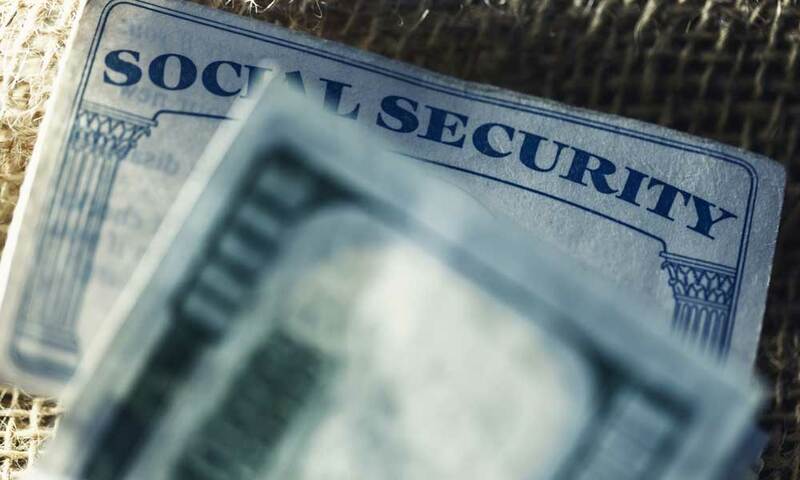 There is a minimum Social Security benefit amount called the Special Minimum Primary Insurance Amount (PIA), but it only applies to a minimal number of retirees who worked at least 11 years with a small income each of those years. Taking those numbers into account, you can expect your monthly Social Security benefit to be right at $1,400; more if you had high earnings and less if you earned below the average. If you want to know how your Social Security benefits are calculated or you want to do some math on your own, there is a formula that is used to figure your benefits. Your 35 highest-paid working years are added up with inflation accounted for, then divided by 420 (the number of months in 35 years). If you worked less than 35 years, a zero amount is averaged in for each missing year. For example, if Jon earned $50,000 for 35 years but was laid off for three of those years making no income. His average earning over 35 years would be around $45,714. He would need to work three extra years so Social Security won’t zero-out those three years Jon was unemployed. Perhaps the most significant factor on how much you will receive in Social Security benefits each month is the age you retire at and start collecting benefits. What you receive when you start taking payments is what you’ll receive for the rest of your life, so it’s important to put some thought into deciding when to retire. Depending on the year you were born, the full retirement age is 65 to 67. If you start collecting benefits then, you’ll get the amount calculated in the Social Security formula each month. You can start getting benefits at age 62, but you won’t receive the whole monthly amount you’re entitled to. If you take your benefits early, you can expect to get about 75 percent of what you would have if you waited. Your benefits are reduced by a fraction of a percent for every month you take early payments. Taking a late retirement swings things in the opposite direction. If you wait until the age of 70 to start drawing benefits, you’ll get about 30 percent more than you would have at full retirement age. Remember there is no best age for retirement, as each person’s finances are different. Taking early, full, or late retirement all end up paying out about the same amount of money over time. Does Income During Retirement Affect Social Security? If you’re earning income while you’re drawing Social Security, your benefits will be affected if you make above a certain point (an amount that changes each year) – but only if you take early Social Security payments. For those under their full retirement year: $1 is deducted from Social Security payments for every $2 earned above the annual limit of $17,040. For those in their full retirement year: $1 is deducted from Social Security payments for $3 earned above the annual limit of $45,360, but only earnings before the month you reach full retirement age are considered. Once you reach your full retirement age, your Social Security benefits are not affected by how much you earn. The general goal of Social Security is for people to receive the equivalent of what they paid in, taking inflation into account. Social Security shouldn’t be your only source of income in retirement, but if you incorporate a 401(k), pension or IRA investments along with your Social Security, you’ll be on your way to a comfortable retirement. Is Social Security Income Taxable? How Much Money Do I Need to Retire? Will Social Security Be There For Me When I Retire?